Mouse over the stations for name, or click on any of the station icons for more information. Most Thais now use the term "subway" although the operators still refer to it as the "metro". The system was opened in 2004, several years after the Skytrain. While the Skytrain is elevated, the subway is completely under ground. The Skytrain was built as an elevated system to save cost and because many believed that an under ground system would be prone to flooding, but when residents saw the impact the elevated system had on the city, the outcry insured that future mass transit systems would be built under ground. This station is right at the Hua Lampong temple and the Charm Chureee square shopping mall. A short walk from the Lumpini Muay Thai Boxing Stadium. The Klong Toei 'thieves' market is not far from this station. If you're attending a convention or trade show at the convention center, the subway can get right to the front door. The Klong Toei fresh market is also within a short walk of this station. As the station's name implies, the cultural center is close by. Closer are several large department stores, the Esplanade shopping mall, and the Chinese embassy. The Swissotel Le Concorde and Bangkok Cha-Da Hotel are both close to the Huay Kwang station. The Grand Ayudhaya Hotel is a short walk from this station. There is not much else around it. There's very little around this station other than offices and homes. The Chaophraya Park Hotel is close to this station. A large parking structure above this station provides an easy place for commuters to park. The station is a short walk from the large Central Plaza shopping center and Sofitel hotel. This station provides an interchange with the Mo Chit Skytrain station. 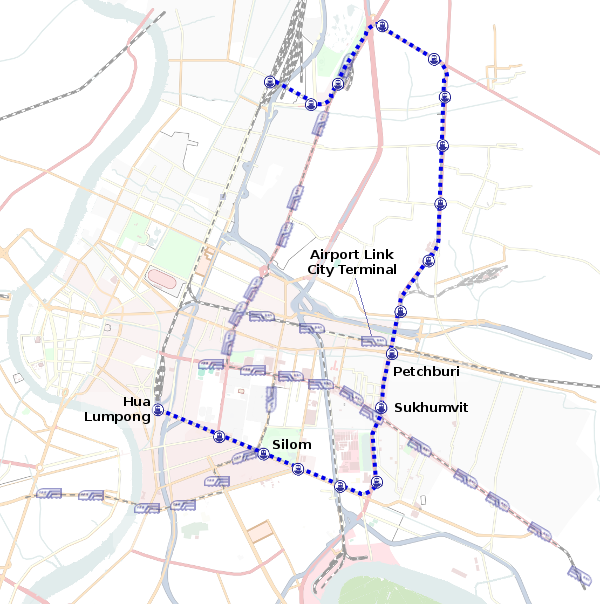 The Bang Sue subway station is right next to a railroad station where you can get trains to northern destinations. See the subway ticketing page for information on fare options. You can visit the official Bangkok Metro web site for more information.